The new year 2018 brought fruitful gains and delightful market optimism among the major indexes. The bulls are obviously in control slapping bears for almost 9 years, in 2017 the market actually hasn’t pulled back more than 3% – this happened last time 23 years ago. Well, and volatility? Yes, super low, the well-known VIX fear index dropped to its lowest level ever. The economic indicators like GDP growth and unemployment have been flashing also pretty green lights suggesting the economy is doing fine in the US as well as on the other side of Atlantic. Summing all up together suggests that investors are celebrating good earnings results for fourth quarter 2017. The second week sparked a lifted momentum and generally positive view in a rise of stocks, leading with financials, energy, healthcare, and industrials. When looking at the technical analyses, specifically trend analyses, the recent increases in stock prices send quite exceptional signals. Let’s have a look at each major index separately. Below are the established bull trend channels that have developed during last two years and within which the price kept moving up and down. The Red Tick Lines represent an outer trend and Orange Dashed Lines represent an inner trend. In the beginning of the year, price has pierced through the outer trend line – more than two years old resistance level. Note, this resistance was established based on two past price reversals which resulted in price decline and slight correction. This time it actually pierced through and seems like it is staying above, which is a sign of a possible new trend setup. On a shorter time scale on an hourly basis, the S&P 500 is so far increasing quite sharp compared to previous months. 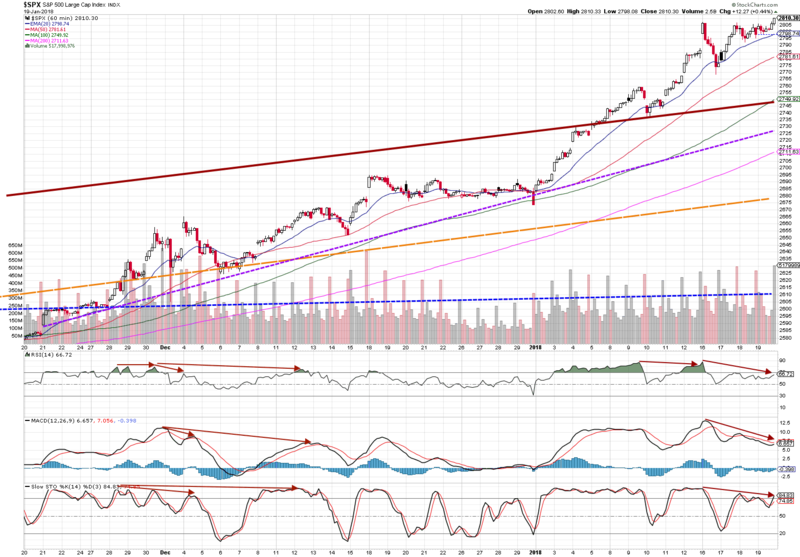 It’s the 20-period exponential moving average (EMA) that recently served as its support level. In the long run as seen above this would be rather perceived as a bounce from the outer trend resistance (possibly becoming support now?). Once the market reverses down, below we can see the potential support levels: The wide red line around 100 moving average is the first and strongest checkpoint, the orange line depicting inner trend is the second checkpoint and blue horizontal support is third. 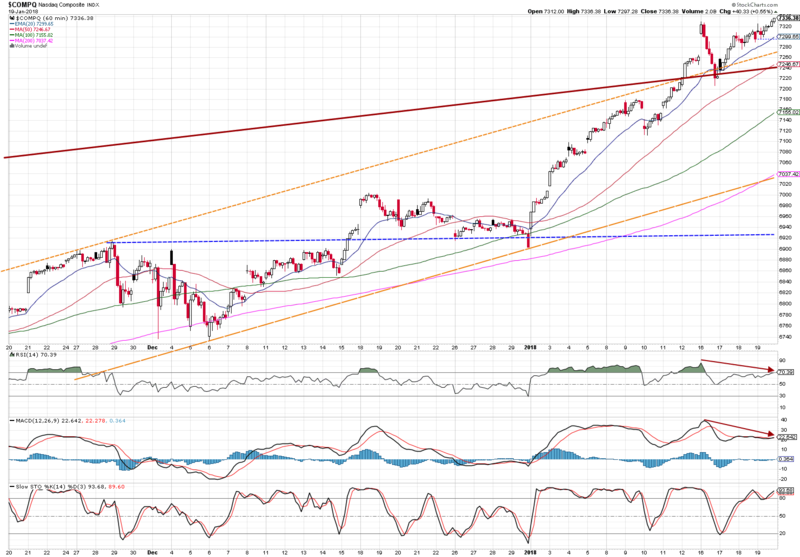 Technology loaded Nasdaq has also just broken through the outer trend resistance. Optimism has been grinding the inner and outer trend resistance lines recently, so let’s see how this is going to unfold. 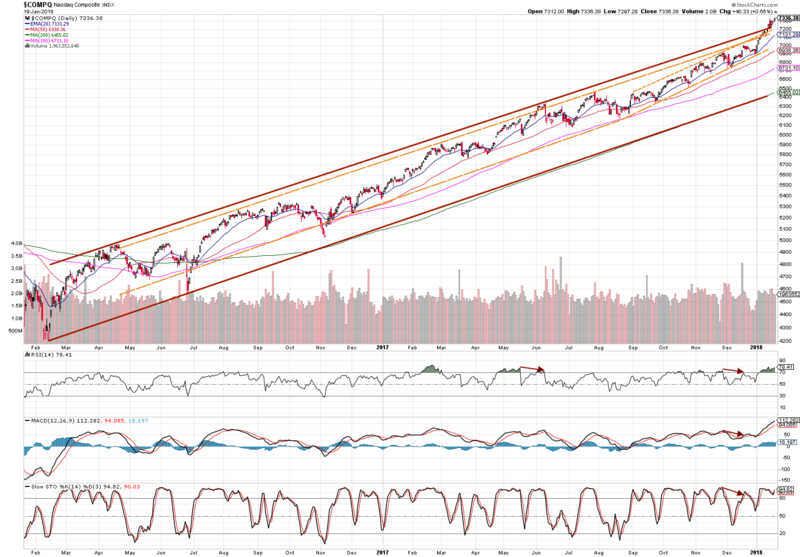 In short run, we are spotting pretty clear view on recent pierce via resistance and also an entire channel. If the price doesn’t hold on orange resistance/20EMA, there are several potential supports, most likely in this order: wide red outer trend line would be the most interesting and checkpoint, orange trend support line is second and blue horizontal support line is third. Looking at the hourly chart, since the break-through at the end of December, the price was steadily sliding on the 20 EMA. 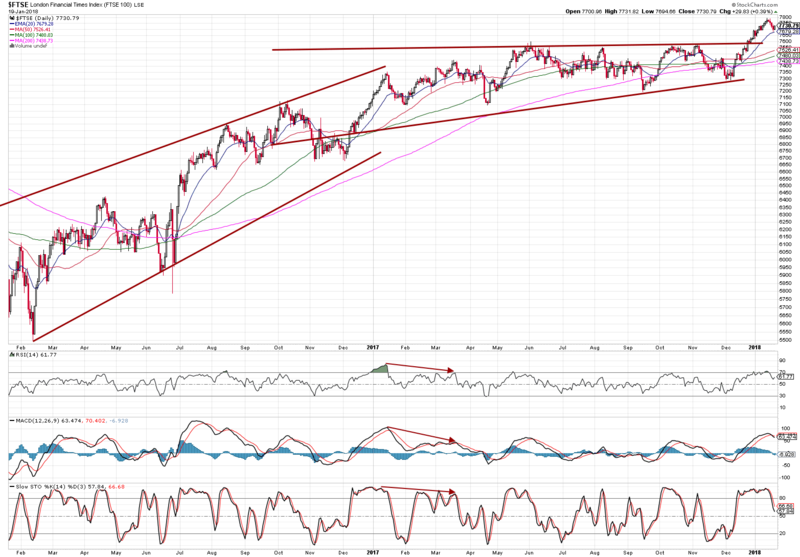 Recently market pulled slightly down searching its support level. 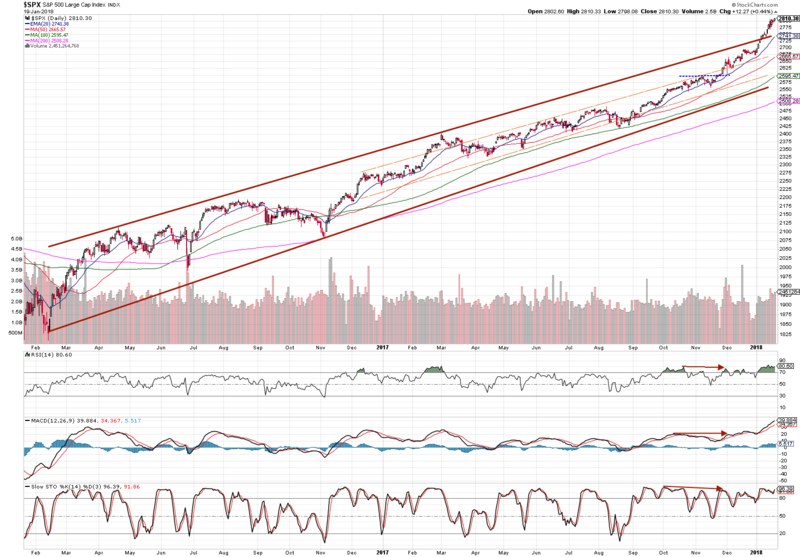 The most possible and most interesting pullback would be the outer trend resistance depicted by wide red line. 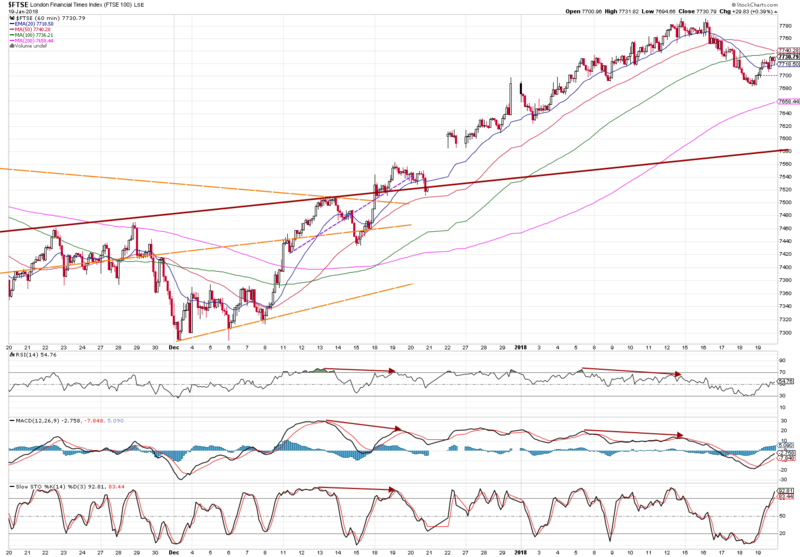 From the long-term chart above it might likely continue rising bouncing off the 20EMA starting on Monday. All the major markets are showing extraordinary gains this year, above the expectations and above the analysts’ projections. Let’s see if we are going to draw a new trend that can be followed or whether this is just a nice silence before the storm!